'For the black hypnagogic fire, the corporeal chaos and beauty of earth and the elements, the rural scape and nocturnal fauna of the Vale & Chase, the secluded night and its astral revealment. For the inexorable return to soil and air of all through the will of cyclic law. For modern mankind and its weak monotheist delusions of ascension. Full-length album, limited to two hundred copies, one hundred with woven patch when ordered here, while stocks last. Released through Ancient Trail Recordings, July 2017. Despite its limitation, this CD is glass mastered, NOT cd-r and as such the price reflects the high cost of production and ensured playback quality. UK = 1.95p / everywhere else = £4 per single copy. 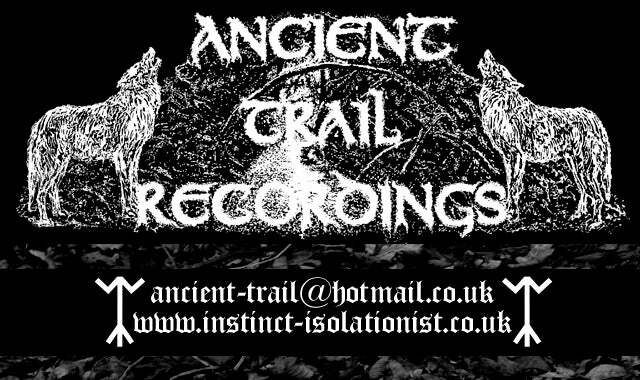 V/Ancient Trail Recordings, July MMXVII.